It’s no wonder why many of us can’t skip having coffee everyday – it’s a pleasure for the body and mind. Like fine wine, enjoying coffee compels each of our senses to interact with one another, to create a whole greater than the parts. The sight, feel, sound and smell of coffee all serve as the gateway to one thing: taste. 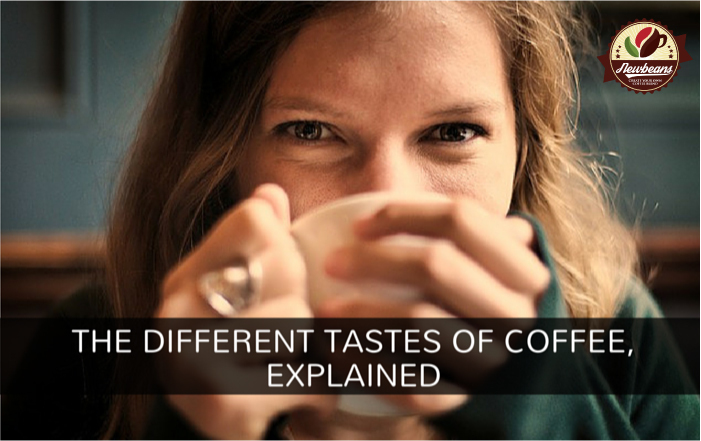 And while you probably know what you prefer in a coffee by now, there are many more variations to discover. At Newbeans, we use as many as 18 (yes, eighteen!) taste profiles to create the perfect cup. The next time you get your beans or brew yourself a cup, try looking out for any of the following flavors, and decide which ones you like best. A natural trait in most origin coffees. Generally evident mostly in Central American. Honduran, Costa Rican and Columbian tend to be Hazel-nutty; Light Guatemalan and Mexican have more of an almond taste and Brazilian and Peruvian more Pea-nutty. A taint in excess, but a natural trait in Brazilian and Peruvian coffees. Depending on roast colours can be like dry roasted peanuts (darker roasts) or light Satay type flavours in lighter roasts. Entirely dependent on the roast profile – the darker the roast the more roasted notes. An unusual flavour trait to be found in coffee, but it can be detected by an unusual dryness in the mouth, especially on the top of the tongue. A taint in excess – sourness can be a result of under roasting or under extracting coffee in the machine. A trait found on the sides of the tongue like acidity. Some sourness can be a benefit if it works alongside sweet notes, giving good complexity to a coffee. Generally a trait found in Sumatran, Indian and Robusta coffees. Spiciness is generally detected in the aftertaste on the back of the tongue and compliments prolonged chocolaty flavours. Dependent on the amount of sugars found in the green coffee and on the roast profile. Sweetness is detected on the tip of the tongue and can be sugary, fruity or chocolaty. Most evident in high grown Central American Arabica. The word describes a taste that some coffee people love — in its raw form, some well roasted robustas have this taste. It allows the coffee taste to cut through the milk, for drinks such as Lattes and Cappuccinos. A smooth form of acidity evident from light acidic and fruit white wine to smooth, rich red wine and on to deep, sugary port. Generally found most in coffees from Sumatra. Which of these different tastes of coffee do you like best? Want to create a signature blend? We can help. Email us as sales@newbeans.co.uk. This entry was posted in Coffee Ideas, Coffee Info, Coffee News, Master Roaster Tips. Bookmark the permalink.